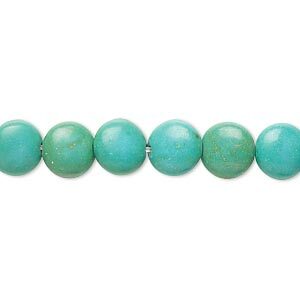 Bead, magnesite (dyed / stabilized), teal green, 14x7mm-15x8mm bamboo, C grade, Mohs hardness 3-1/2 to 4. Sold per 15-inch strand. Item Number: H20-E2999CL Have a question about this item? 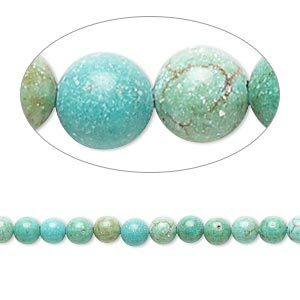 Bead, magnesite (dyed / stabilized), teal green, 7-8mm puffed flat round, C- grade, Mohs hardness 3-1/2 to 4. Sold per 15-inch strand. 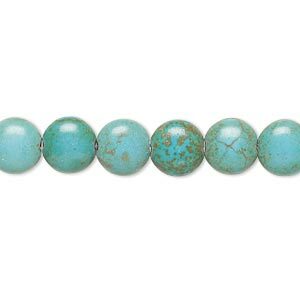 Bead, magnesite (dyed / stabilized), teal green, 3-5mm round, C- grade, Mohs hardness 3-1/2 to 4. Sold per 15-inch strand. 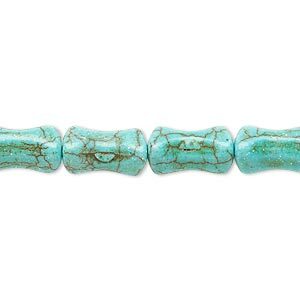 Bead, magnesite (dyed / stabilized), teal green, 7-8mm lentil, B- grade, Mohs hardness 3-1/2 to 4. Sold per 15-inch strand. 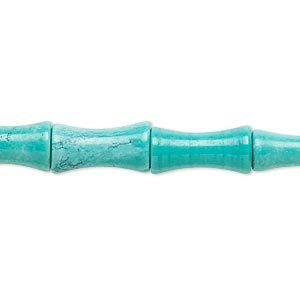 Bead, magnesite (dyed / stabilized), blue-green, 11x5mm-13x7mm contoured tube, C+ grade, Mohs hardness 3-1/2 to 4. Sold per 15-inch strand. 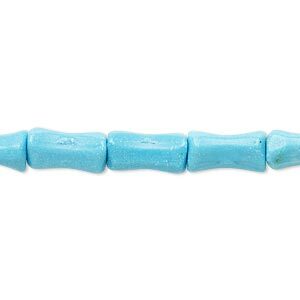 Bead, magnesite (dyed / stabilized), blue, 11x5mm-13x7mm contoured tube, C grade, Mohs hardness 3-1/2 to 4. Sold per 15-inch strand. 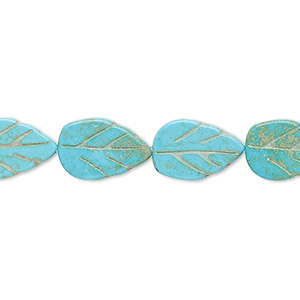 Bead, magnesite (dyed / stabilized), blue-green, 13x8mm-14x9mm carved leaf, C grade, Mohs hardness 3-1/2 to 4. Sold per 15-inch strand. 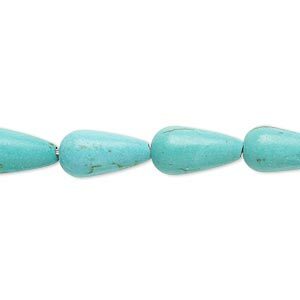 Bead, magnesite (dyed / stabilized), blue-green, 13x7mm-14x8mm teardrop, C grade, Mohs hardness 3-1/2 to 4. Sold per 15-inch strand. 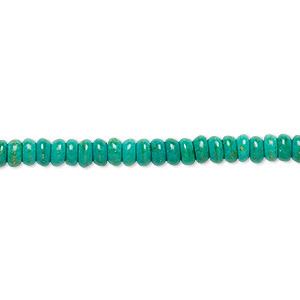 Bead, magnesite (dyed / stabilized), teal green, 4x2mm-5x3mm rondelle, C grade, Mohs hardness 3-1/2 to 4. Sold per 15-inch strand. 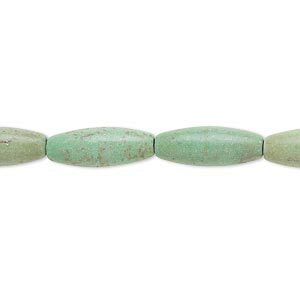 Bead, magnesite (dyed / stabilized), matte green, 14x5mm-16x6mm oval, C grade, Mohs hardness 3-1/2 to 4. Sold per 15-inch strand. Minimum 2 per order. 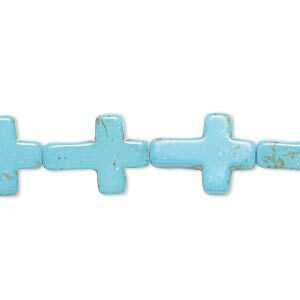 Bead, magnesite (dyed / stabilized), blue-green, 15x12mm-16x12mm cross, C grade, Mohs hardness 3-1/2 to 4. Sold per 15" to 16" strand.